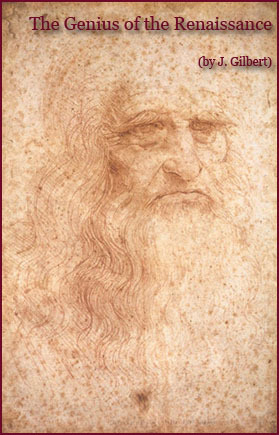 Leonardo da Vinci excelled as a painter, sculptor, asrchitect, and engineer. Statesman, writer, and patron of the "tatesman, writer, and patron of the arts, Lorenzo de' Medici, lord of Florence (1469-92), was a key figure in 15th-century Italian political life and in humanist and Renaissance culture. When the pope cancelled the Medici bank concession in Rome, Lorenzo used public money to enlist the support of the wealthy middle classes and encouraged a radical revival of interest in philosophy, literature, and the visual arts. Crushing the conspiracy of the Pazzi family (1478), in which his brother Giuliano was murdered, Lorenzo consolidated his personal power. 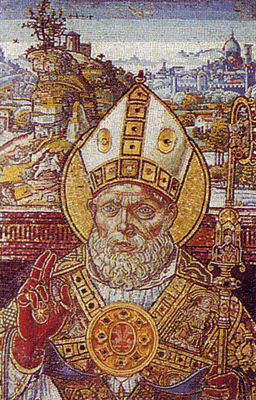 Aiming for a political balance between the Italian states, he ensured that the precept and example of the Florentine Renaissance spread to Rome, Venice, Milan, and Naples. The Careggi Academy, of which he was patron, and whose members included Ficino, Pico della Mirandola, and Politian, was the centre from which the concepts of Neo-Platonism were diffused throughout Europe. 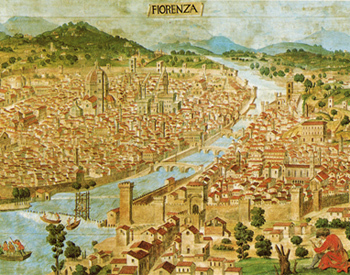 Museo Storico Topografico Firenze Com'era, Florence. inlaid marble in geometrical shapes. Sandro Botticelli, Portrait of a Youth, (1470-77), detail with the medal of Cosimo Medici, Galleria degli Uffizi, Florence. Cosimo (1389-1464), known as pater patriae, was much concerned with business affairs and owned a notable collection of antique vases, carvings, cameos, "unicorn" horns, and other priceless artefacts. 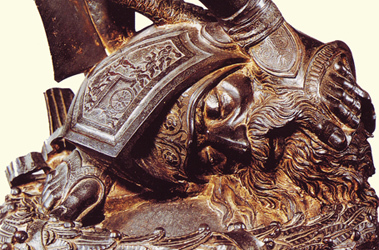 Lorenzo enriched the family collection with medals, antique statues, and objects of applied art. 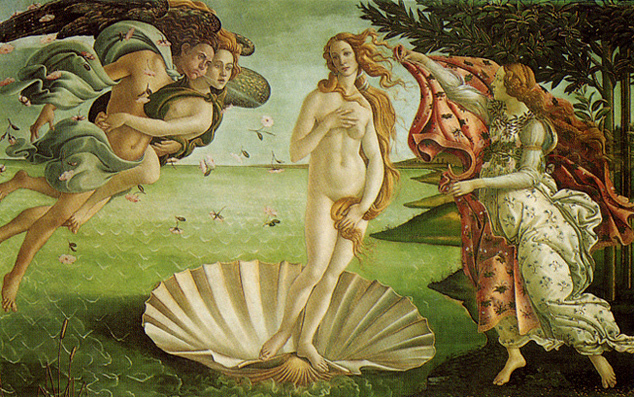 Sandro Botticelli, The Birth of Venus, 1480, Galleria degli Uffizi, Florence. is a return to classical paganism, with allegorical overtones. 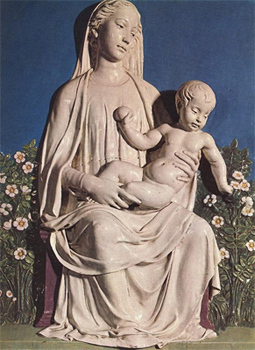 The Chronicles of Benedetto Dei tell us that in about 1472 Florence boasted the presence of 40 workshops devoted to painting, 44 to goldsmithery, 50 to engraving in relief and half-relief, and more than 80 to inlaid and carved woodwork. A city bustling with commerce, Florence profited from the building fervor of Cosimo's day, and developed a culture exemplified by the products of workshops and corporations that found a market beyond the immediate region and were also exported abroad. There was a demand not only for painting and sculpture but also for goldsmiths' work, coffers, banners, stained-glass, miniatures, carvings, marquetry, wax ex votos, furniture, decorations for fireplaces and basins, wool and silk materials, leather and ceramics. 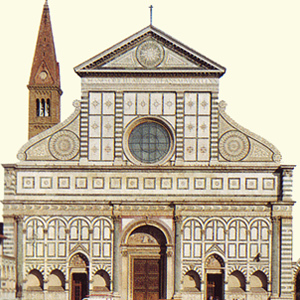 The shops produced both objects of general everyday use and expensive specialized articles, publicly or privately commissioned: as well as the lords of the city, patrons included families known locally for their generosity, like the Tornabuoni, the Strozzi, the Sassetti, the Portinari, and the Vespucci. Museo dell'Opera del Duomo, Florence. 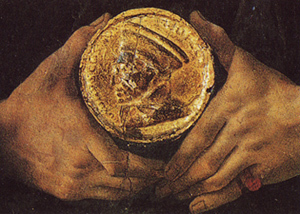 Maso di Bartolomeo, Reliquary of the Sacro Cingolo Chapel, 1446, Museo dell'Opera del Duomo, Prato. 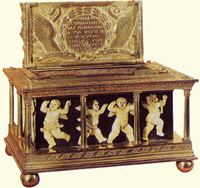 This object reproduces on a small scale the putti of Donatello's Cantoria in Florence, effectively demonstrating the successful application of Donatello's style to cabinet work and tapestry. 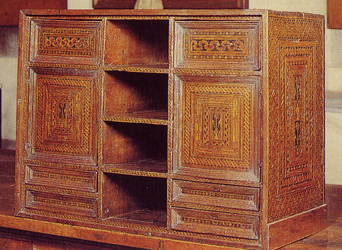 Florentine 15th-century Cupboard, inlaid walnut, Home Museum, Florence. Production of cupboards in the following century moved from Florence to Liguria. Medici Palace, built by Cosimo in 1444, in the Via Larga. worked in onyx, showing Bacchus and Ariadne.